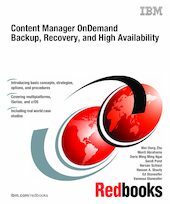 This IBM Redbooks publication helps you understand backup, recovery, high availability, business continuity strategies, and options available for IBM DB2 Content Manager OnDemand. We begin with an introduction of the basic concepts of backup and recovery, high availability, disaster recovery, and business continuity. We also provide an overview of IBM DB2 Content Manager OnDemand. Because OnDemand is available on multiplatforms, iSeries, and z/OS, we address each platform separately, and discuss the backup and recovery strategies and options for each platform. In addition, we discuss various high availability and business continuity strategies and options. When applicable, we provide practical procedures and steps to accomplish backup, recovery, and high availability with sample commands and scripts. In some instances, case studies are presented to show you how real-world businesses implement backup procedures, high availability configurations, and disaster recovery plans. This book is intended for IT architects, IT specialists, and OnDemand system administrators who are responsible for designing, implementing, and maintaining OnDemand systems for various platforms.